As it’s the first day of the final month of the year, it’s too early to write my Blog Readers Book Choices 2015 for the last half of the year, but I felt some sort of stock taking was in order to shape my reading for the month of December. 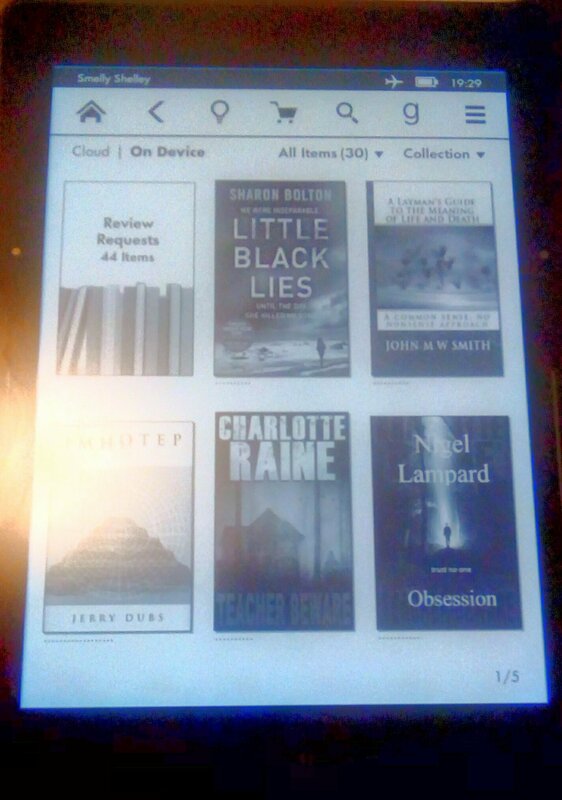 Currently I have a list of forty-four books, loaded onto my Kindle, which have been brought to my attention by authors and publicists, that I have accepted to read and review. Looking at the list, the requests date back to mid-October 2015, which currently makes the waiting time from the time a review is requested to being published seven and a half weeks. The number of books I have purchased to read from my own personal browsing is twenty-nine. The book waiting the longest on my own personal reading list has been waiting since January 2015 to be read. I am pleased that I have managed to read more books that I would have picked to read this year, but I am disappointed with myself for pushing a book back ten months from purchase without realising it. I read approximately twenty-five books a month so I will get through current book review requests of books loaded and ready on my Kindle in approximately two months so I don’t feel pressured or pushed for time. I do feel a sense of loss though when I realised I still haven’t read books I added to my wishlist from last year’s Goodreads Book Awards. There will undoubtedly be books from this year’s winners I would like to read once the list is published and that is what makes me feel pressured. Am I missing out on books I would read if I wasn’t accepting review requests? If I stop accepting book review requests now, I will not run low of books until middle of 2016, I am not counting the books I will be recommended from Kindle First and those I have yet to purchase from my ever-growing want- to-read list. Looking at these stats, I am tempted at this point to plan to stop accepting review requests and see how my reading list would fare if I only read and reviewed books I bought from my own personal browsing. Would it be expensive? Would I read more books I want to award five stars? It would be interesting to see. Were you ever able to get a copy of Lifeblood? I’d be curious to know what you think of it. I do have a copy of Lifeblood, which arrived a bit late for my Halloween reads, but I am itching to read it. I was thinking of saving it for next year’s Halloween reads but I’m not sure I can wait that long. Interesting post! I have similar problems, I have over 70 bought unread books on my Kindle, some purchased as long ago as last Christmas! I keep trying to take a step back from review copies to concentrate on my personal collection, but I still have around 15 review copies waiting at the moment and it’s always so tempting to try something new! It is a dilemma. It is a dilemma as reading is supposed to be me time but sometimes it feels like I’m meeting the agenda of others rather than entertaining myself. I try to avoid physical books as they throw my list into confusion. I don’t consider myself to be a book reviewer (other than being part of Rosie’s team) but I do review the books I read as a reader. This is a very interesting post as I am planning on doing one similar (and will link to this if I may) having done my accounts for the year and found out just how many books I have downloaded. I was pretty shocked and it’s no wonder I am way behind on reading and reviewing! Of course you are welcome to link to anything on my blog. The books really do mount up, which I became aware of last year but thought that being more selective with review request books I would lighten the load, but alas it doesn’t feel this way. I am primarily a voracious reader, the reviews I write are an incidental. It just feels like a shame with all I read that I am not getting through my personal wishlist.